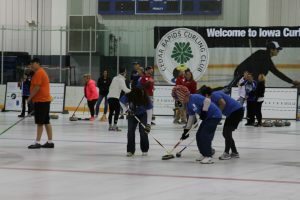 We held our first Sweeping for Change curling tournament on Friday, August 11 at the Cedar Rapids Ice Arena. Six teams from Cedar Rapids Bank & Trust, General Mills, Morgan Stanley, Simmons Perrine Moyer Bergman, United Way of East Central Iowa, and Wells Fargo took to the ice for some friendly competition. 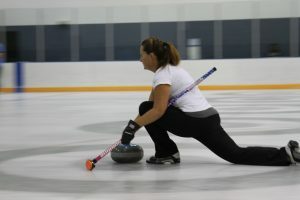 Since many of the participants had never curled before, a clinic before the first match helped teams feel more comfortable on the ice and with the equipment. Teams also had fun learning from Debbie McCormick, four-time curling Olympian and world champion. As champion and team spirit award winners, General Mills received awards including a United Way insulated bag coolers and ½ gallon water jugs. The team The Lawyers won the “Nowhere to go but up” award, since they ended the game with five points each team received at the beginning of the match. The Lawyers received United Way packs of tissues as a prize so they could dry their tears. Sweeping for Change raised $4,000 for United Way’s general fund. Team registration fees will go toward the annual campaign. Thank you again to our sponsor Simmons Perrine Moyer Bergman for making this event possible and to Cedar Rapids Ice Arena for hosting us. And a big shout out to everyone who joined us for our first curling tournament!